born 10 Apr 1898 in Texas. Francisco Briceño was born on February 3, 1869 in Santa Rosalia, Chihuahua, Mexico, the son of Francisco Briceño and Guadalupe Fierro. 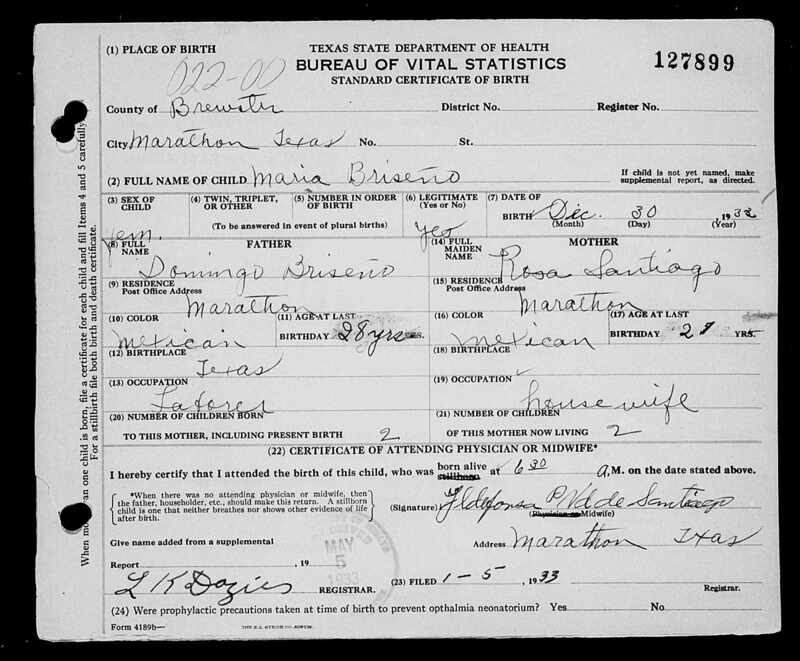 Juliana Garcia was born on April 12, 1875 in Fort Stockton, Texas, the daughter of Dionicio Garcia and Simona Jiménez. They married on October 10, 1895 in Fort Davis, Texas. Francisco and Juliana remained in Fort Davis into 1898, then moved to Marathon, Texas. In 1902, they moved to Terlingua, Texas with Juliana’s mother Simona, sister Severa, and brothers Julian and Dolores. 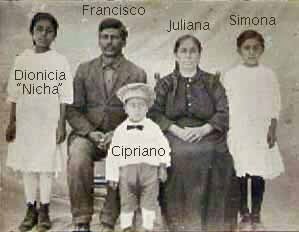 Francisco, Juliana and children returned to Marathon in 1906. According to census records, Francisco worked as a freight wagon driver in 1910 and as a teamster in 1920. When they were living in Marathon, Dionicia "Nicha," born in Marathon in 1909, and Simona, born in Marathon in 1911 played with their neighbors Antonia and Matilde Rocha. Click here to read more about the photo in the Andres Rocha page. The information on this page is from the Documented Research Report on the Briceno Family with permission from Bob Wirt and Louisa Madrid. Click here or the icon to the left to see the report. * On June 12, 2010 this page was updated with information from this report and three children were added to the family. On Dec 12, 2014 we added Andres Rocha's photo of the two Rocha girls playing with the two Briceño girls. Click here to link to Bob Wirt's site Life Before the Ruins. The photos on this page were provided by María Louisa Franco Madrid except as noted.